There are actually three Hamilton Perry models. The first was introduced in 1931, the last in 1962, and the middle Perry was introduced in 1948. The 1948 version was the most prolific and produced for five years. 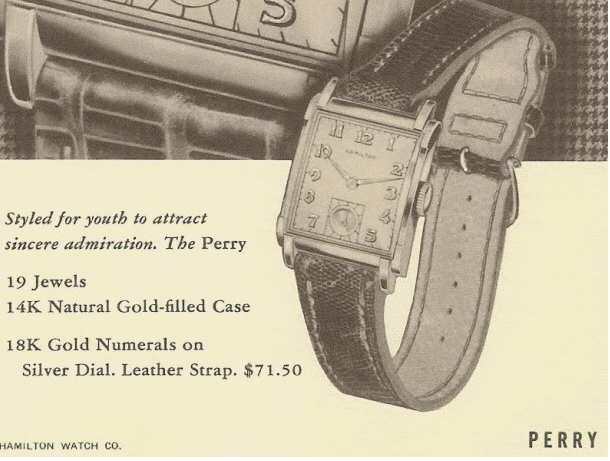 The Perry featured a 14K gold filled case with 18K gold numerals on a sterling silver dial. Only an AGN dial was available. 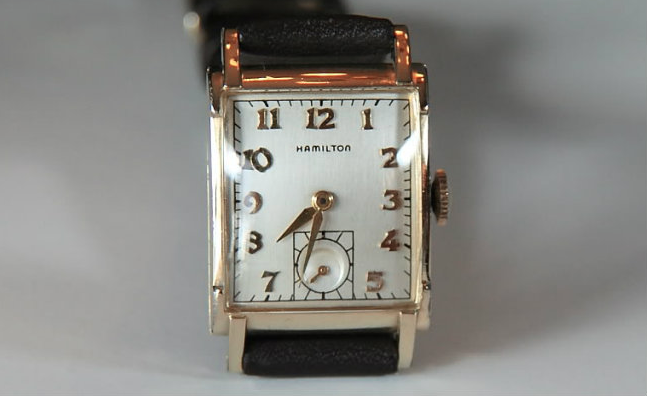 Under the dial was a high grade 19 jewel, 14/0 sized 982 movement. The Perry tends to wear fairly well and will often show some minor wear through to the edges of the lugs and corners of the bezel but very nice examples are easy to find. I've had the opportunity to restore a number of Perrys. They are good candidates for restoration since the cases are usually in nice shape - which is the most important part. But sometimes the dials can really show their age. 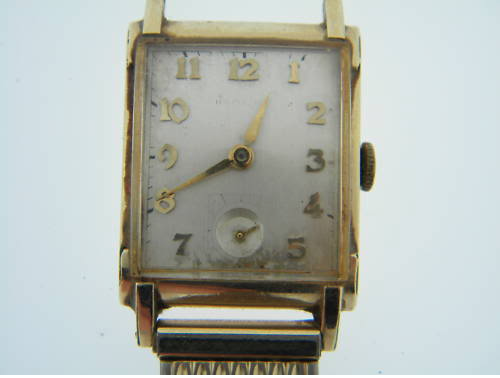 The example below is typical... look how dirty this watch was... this must have been "a working man's watch". The dial had lost most of its printing so a redial was definitely in order. After a thorough servicing, polishing the case and installation of a new dial and glass crystal, this Perry was restored to its original glory. I am so excited to find this information about the Perry. My Dad owned a Perry and the story was that he received it when he graduated from high school in 1939. I found it many years later and wore it when I went to high school in the 1960's. I forgot about it when I received my own watch for graduation and just ran across it 3 months ago when I found it in a shoe box in my Mom's closet. I took it to be serviced and repaired and just got it back today. It's beautiful and I will again wear it with pride. I just snagged one of these 1948 classics. Dynamite look! What size wristband do I need to look for? 18mm? 20mm? Please advise. And thank you for a terrific webpage! My father had one of these and it disappeared 45 years ago. I'd love to find one! I found my late father's Hamilton Perry recently, and just got it back after having it restored. I love it. I’m sure that is a wonderful keepsake.